Organisation Management is one of the primary working screens you will use in Calxa. This is where you will go to connect to your accounting data and run organisation updates. You can also copy a Calxa organisation from one workspace (local, network, online) into the current workspace from this screen. Business Unit Terminology for your organisation is shown and can be customised on the Organisation Management screen. 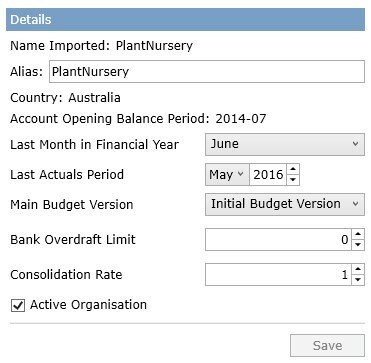 You can also see and make changes to settings such as the Last Actuals Period, Last Month in Financial Year, Main Budget Version, Bank Overdraft Limit, Consolidation Rate, Alias and Active Organisation. Online workspace users can take a point-in-time data backup via Copy Organisation. Note: Offline accounting files like MYOB AccountRight (Local and Network libraries) and MYOB Classic are not supported for use with a Calxa online workspace. You must use an online accounting file with an online workspace. To copy an organisation from another Calxa workspace into the current workspace (local, network or online) click the Import button. Note that all organisation data will be copied with the exception of report bundles and custom KPIs. Please see the help note Copy an Organisation from Another Calxa Workspace for full instructions. To delete an organisation from your workspace click on the blue Delete link to the right of the organisation name. You will receive a pop up prompt asking you if you're sure you want to delete the organisation. Click on Delete Organisation permanently. A final box will pop up asking you to type the word DELETE into the empty field to confirm the deletion. Click OK. 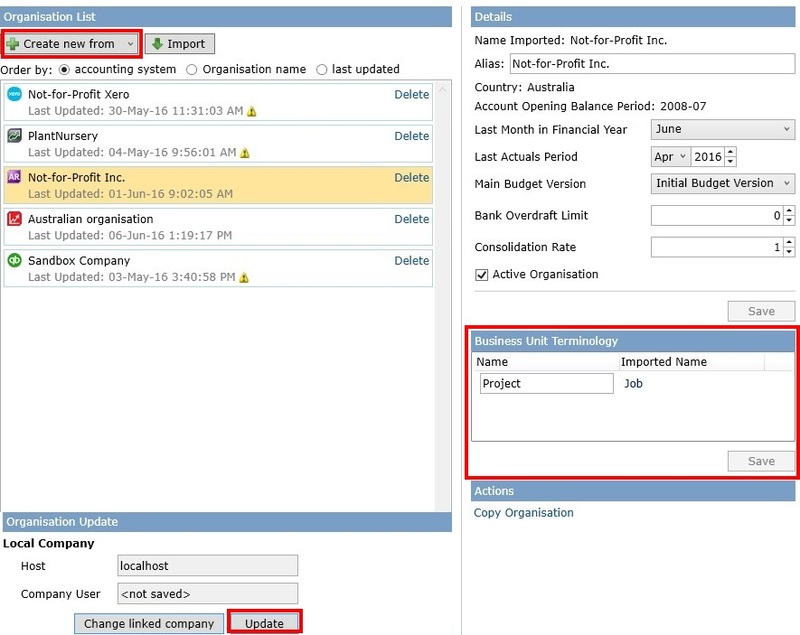 Various settings such as the Last Actuals Period, Last Month in Financial Year, Main Budget Version, Bank Overdraft Limit, Consolidation Rate, Alias and Active Organisation can be changed on the Details section of the Organisation Management screen. The Alias field allows you to change the name of your organisation accounting file in Calxa without changing the name in your accounting system. This name change will be reflected on all Calxa screens and reports. Below is the organisation name before changing it via the Alias field. To apply an alias to an organisation, select it in the Organisation List. You have selected it when the colour is yellow. Type the desired organisation name in the Alias field and click Save. The Country field shows what country type was used to create your accounting file and this country will be used for regional number and currency formatting. Account Opening Balance Period is the opening balance period in your accounting file. Both fields are for information only and cannot be edited in Calxa. The Last Month in Financial Year is detected from your accounting file data. 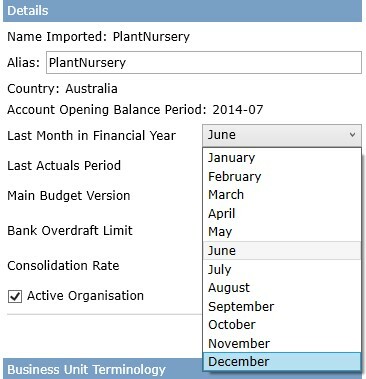 When the default value is June it indicates the organisation’s financial year runs from July-June. 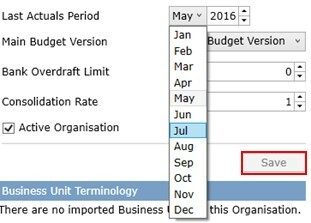 You may wish to temporarily change the Last Month in the Financial Year to enable editing of budgets or running reports with a different financial year end. For example, NFP customers with a July-June financial year may want to run the Unspent Budget report on a calendar year basis, however this report runs on the organisation’s financial year by default. To change the Last Month in Financial Year click on the drop down and select the desired month. Click Save. When you update your organisation the Last Actuals Period is updated to show the last full calendar month. The actuals imported during an organisation update are not affected by the Last Actuals Period. This setting is used for controlling actuals behaviour for certain reporting and budgeting. To change the Last Actuals Period click on the month drop down and select the desired month. Do the same with the year drop down. Click Save. Changing the Last Actuals Period will affect the date selection options available in the report criteria for various reports including Financial Statements and forecast reports such as the Balance Sheet Forecast and Cashflow Forecast. An example of where you might change Last Actuals Period is when you want to run a month-to-date Profit and Loss Statement. You could achieve this by changing your Last Actuals Period to the current month. 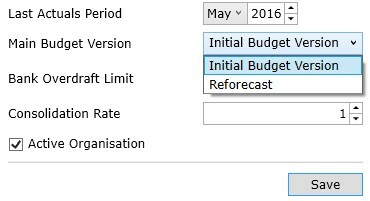 Another situation where you might use this feature is to create a budget via the Budget Factory that includes YTD Actuals. The Last Actuals Period allows you to control how many months of actuals will be copied into the budget. See the Create Budgets using YTD Actuals and Current Forecast help note for details. The Main Budget Version represents the Default budget version on your Create or Update Budget screen. It’s the 1st budget version you’ll see listed in your report criteria initially (once another version is selected it will remain there until another version is selected). Main Budget Version can be used in conjunction with Last Actuals Period to create a budget via the Budget Factory including YTD actuals and the desired budget version for the remaining months. See the Create Budgets using YTD Actuals and Current Forecast help note for details. To change the Main Budget Version click on the drop down and select the desired budget version. Click Save. If you have an overdraft with your bank you can reflect this in your Cashflow Forecast report by entering the amount of the overdraft in the Bank Overdraft limit field. The figure can be typed directly in the field or can be selected by the up and down arrows. Click Save. Consolidation Rate is used for multiple organisation consolidations. It allows you to consolidate organisation files with different currencies and can also be used to consolidate companies with differing levels of ownership. Please see the help note Use Consolidation Rate for Multi-Currency or Partial Ownership Consolidations for details. To update the organisation consolidation rate type the rate directly in the field or select a rate using the up and down arrows. Click Save. Organisations in your workspace can be marked as active or inactive. You may wish to make an organisation inactive if you no longer report on it regularly but still wish to keep it in your workspace. To make an organisation inactive uncheck the tick box and click Save. The Copy Organisation feature allows you to quickly create a copy of your organisation within the same workspace. You may wish to use this as a quick point-in-time backup or for the purposes of ‘having a play’ without affecting the main working data. To copy, first highlight the organisation you want to copy in the Organisation List by selecting it. Then click on the Copy Organisation link. After the organisation copy completes you’ll see a 2nd organisation with the same name and a ‘1’ after it (if it’s the 1st copy). You can change the name via the Alias field described above. This feature is currently supported for AccountRight Live integration only. Organisations who are registered providers with the National Disability Insurance Agency (NDIA) will have access to the NDIS Provider Portal. 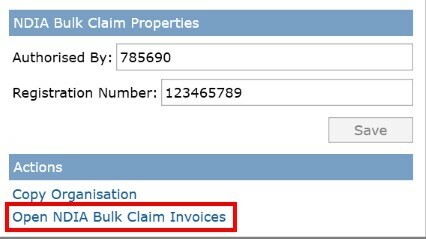 The Bulk Claims Upload interface allows providers to make bulk claims by uploading a specifically formatted CSV or XML file containing the claim details. Calxa provides a feature to easily create the required CSV file. Please see the help note NDIA Bulk Claims Upload for AccountRight Live for details.